Retaining walls and sitting walls are important outdoor structures that should not be neglected. They are effective in preventing soil erosion, making outdoor structures more stable and also for providing more seating. With sturdy walls built in strategic locations around your property, you can improve safety in the outdoor area. They can hold eroding soil, which can pose safety risks to you, your family, and your guests. These features will also protect the various landscape elements that may be damaged by flooding and eroding soil. With these critical functions, you must ensure that every retaining wall in your property is designed and built by professionals like us at LR Landscaping & Pavers. Our company has been in the hardscaping industry for decades, and we have designed and built countless retaining walls for California clients. Our long list of satisfied clients comes from Sacramento, Auburn, Roseville, Folsom, Citrus Heights, Rancho Cordova, Rocklin, Lincoln, Fair Oaks, Yuba City, and other cities in the state. The walls that we've installed for these clients are known for their sturdy construction and awesome designs. You, too, can have these kinds of walls in your property by calling our hotline today. Our friendly staff will assist you in all your concerns. Every retaining wall or sitting wall that we create for residential and commercial clients in Sacramento, CA is guaranteed to be sturdy, functional, and appealing. At LR Landscaping & Pavers, we don't build walls that can be easily damage or require frequent maintenance works. Instead, we follow systematic procedures that results in outstanding outdoor features. Our crews perform careful planning and ensure the proper selection of wall materials. We consider the needs of our clients, the function of the walls that we will build, and the topography of the outdoor area. These pieces of information will help us come up with the perfect retaining wall design for our clients. During the installation phase, our crews will only use proven methods and topnotch products. Our approach always results in smooth workflow and quality workmanship. 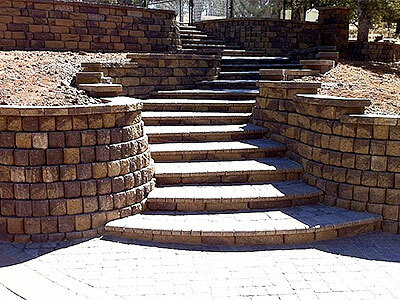 At LR Landscaping & Pavers, we also custom design and build sitting walls. One of the great benefits of a sitting wall is that it not only provides the structural function of a retaining wall but it is also constructed to provide you with extra outdoor seating. These walls are typically low walls with a flat top which allows your friends and family to use the wall for seating. This can be a very useful feature for your outdoor living areas, especially when you are entertaining many guests! The overall design of the retaining and sitting walls is always our prime consideration. Our creative personnel will help you come up with stunning design combinations that will surely make your outdoor area more fun to be at. You can also drop by at our office so you can take a glimpse of our sample designs. We can design and build seat walls, freestanding walls with built-in seating, accent walls, flower beds, and walls for other landscape elements. Our use of premium quality retaining wall blocks is just one of the many reasons why most Sacramento clients prefer us over other contractors. Our retaining wall blocks come from Unilock and other leading hardscape manufacturers in the country, so you are assured of their quality. The blocks that we use have modern features for easy installation and the creation of more durable structures. Call us today to learn more about the retaining walls and sitting walls that we can design and build!